Suzuki’s V-Strom is a firm favourite in the adventure bike stable, and following the launch of the more off-road capable ‘XT’ variant, the Japanese bike manufacturer was keen to show exactly what it could do. Their V-Strom Academy, based in Italy, has since proved to be extremely popular, giving riders a chance to both put the bike through it’s paces and sharpen up their riding skills. Following close collaboration with our Italian colleagues, Anlas Tyres were chosen as the official Technical Partner earlier this year. 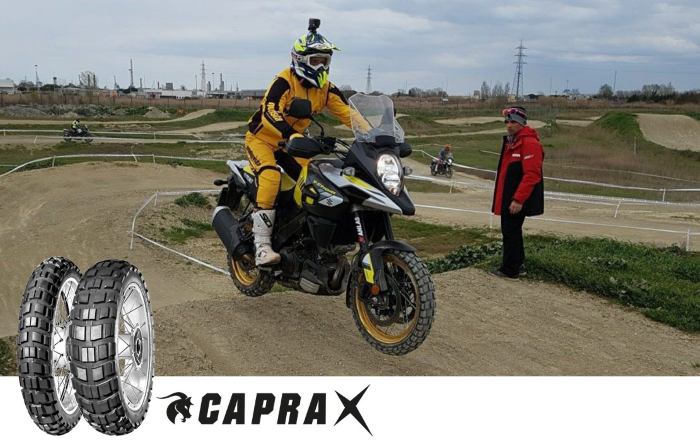 Both the 650 and 1000cc models used by the academy are now fitted with the proven Capra X dual-sport tyre, which is used by riders to tackle a range of riding conditions, both on and off the tarmac. Riders attending the academy work their way through a range of riding exercises, safe in the knowledge that the Capra X offers ample grip on the various terrain at the academy. You can find out more about our adventure range including the Capra X here. Previous Previous post: Winter Grip 2 Tested… In Summer!